Gold just doesn't seem to want to go down in price, so more folks are looking to sterling silver as their precious metal of choice. Sterling silver is an outstanding jewelry metal--on most people, jewelry made of silver acquires a beautiful, mellow patina as it ages. Some silver jewelry, though, is plated with rhodium to retard tarnishing, and this plating will prevent that patina from developing--it also will mean that you should not have to polish the item. 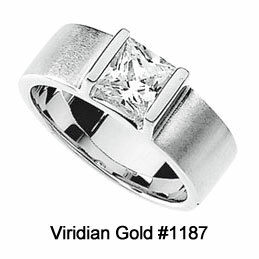 At Viridian Gold, we always indicate if an item is rhodium plated. 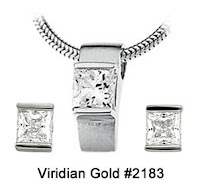 We have added lots of new silver items in the last several months. Like our #1187 Princess-Cut CZ Silver Ring, shown above, and the matching CZ Necklace and Earring Set, item #2183 shown to the right. 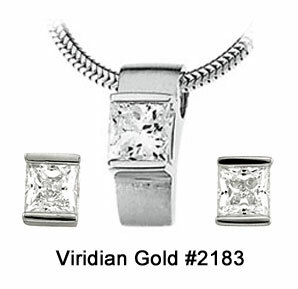 Check our our huge Sterling Silver Collection, and find your perfect locket, earrings, ring, pendant or pin! On some folks, their body chemistry just won't allow them to wear silver--it will turn black after only a few hours of wearing! And, some swimming pools will discolor silver, too. So, if you happen to have this reaction, you will need to stick to gold, stainless steel or platinum for your jewelry.